Back in 1997 he bought Gotty for an amount of $1,300, from Tony Moore. Richard probably didn’t know at the time what a great buy Juan Gotty was. Tony owned Grey Line Kennels in Los Angeles. The Greyline foundation female was named Showtime. Showtime was the mother of Gotty’s father, “R Greyline’s Raider 2. Raider passed away when Gotty was only 7 weeks old. This was just the beginning for Gotty’s long line of fantastic foundations. If you’ve heard these names, Coldens Blue Rhino, Felony, Pate’s Blue Beast, Gottiline’s Monster, Do Good Big Boy, New Trojan’s Dillinger, and many others. These are just some of the foundations of Gotty. In all, Gotty has sired more than 900 UKC registered American Pit bull Terriers. Starting out with Juan Gotty, the Gottiline bloodline not only spread all across the US, but also the world including China, but also Canada, Japan and the Philippines. Gotty will be known in history as one of the bully style movement’s greatest dogs. 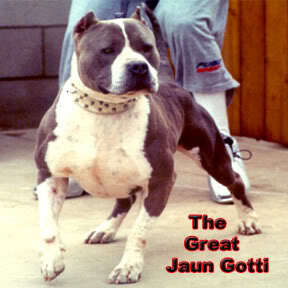 So, the Gottiline Pit bull Bloodline is named after The Notorious Juan Gotty. Only the “y” was changed to an “i”. The look of the Gotti is very distinctive. They are usually fairly easy to tell apart from other pit bull bloodlines. A Gotti pit bull has tons of mass and is very stocky with lots of girth. They are sometimes heavier, thicker and shorter than other pit bulls. The head is brick-like. It is extremely broad right between the cheeks, and the head sits on a well-defined and amazingly thick muscled neck. The broad distance between those cheeks is created to house those powerful jaws. Many pit bull lovers say that they can’t tell the difference between a Razors Edge Pit bull and a Gottiline Pit bull. A trained eye can tell the difference. Their coloring may often have oil spotting or oil specking on the coat. This is very apparent on a white Gotti. This isn’t always the case, but there are many that have this feature that doesn’t appear in Razors Edge. The personality of the Gotti is one of a good temperament. With pit bulls still carrying the reputation of being dangerous and aggressive dogs, the Gotti is actually the absolute opposite. These pits are bred without the aggression and fight that pit bulls were used for in the past. Now they are considered to be loving pets in anyone’s home. They are good with children and even other dogs if the dogs were raised together. The Gotti will be loyal to his family and property and will used his strength and power to protect both. 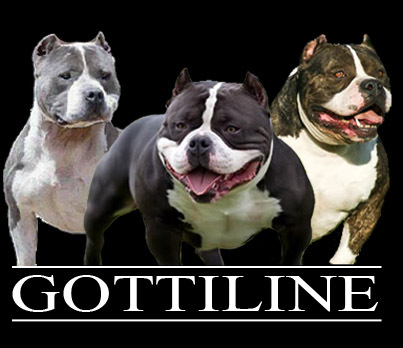 There are other bloodlines that are related to the Gottiline pit bull bloodline. 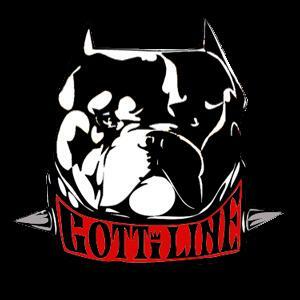 Gotti is the foundation for Mikeland’s Kracker and Gator and also Kingpinline’s Goliath. Besides these unique lines, he is also the foundation for many of the bully pit bulls that weigh more than 90-100lbs., considered to be the XL pitbulls. On the other side of the scale, Gotti is also the foundation for many pocket pitbulls that weigh less than 60lbs. Juan Gotty has created many unique and diverse kinds of pit bulls and played a huge role in the development of our newer breed, the American Bully. Yet each one is exceptional in its’ own way. They each have unique qualities and factors that make them special. Notorious Juan Gotty is a legend in the dog game and probably the most well known in the movement of the bully pitbull (what people were beginning to call the pit bulls carrying the dense bone, blocky head and added muscle mass during the creation of the American Bully before it was a recognized breed.) No matter what the size of the Gottiline Pit bull, the bone, head and extreme girth are usually factors in this particular bloodline.